We see moderation in loan growth, NIM expansion and fees in 2Q18. However, asset quality remains benign while credit costs stay muted. Banks’ share prices could suffer bouts of volatilities whenever trade war rhetoric intensifies or when the Chinese renminbi depreciates significantly. We prefer OCBC as it is a laggard with potential to catch up in NIM expansion and dividend payout. OCBC and UOB beat expectations but DBS was marginally below expectations. Moderated expectations on loan growth. DBS has moderated guidance for loan growth from 8% to 6-7% for 2018 due mostly to trade loans, which accounted for 13% of total loans as of Jun 18. While highlighting the risks from an escalation in trade tension, OCBC and UOB have maintained guidance of loan growth at high single digit, having already achieved loan growths of 6.3% and 5.8% hoh respectively in 1H18. DBS and UOB lead in NIM expansion. DBS, OCBC and UOB achieved NIM expansion of 11bp, 2bp and 8bp y-o-y respectively. DBS and UOB achieved strong growth in net interest income of 17.8% and 13.7% y-o-y respectively. OCBC has been a laggard for NIM expansion but should catch up in 3Q18 as it re-prices its portfolio of mortgages. On a q-o-q basis, DBS' NIM expanded 2bp but OCBC and UOB's NIM were flat. Moderation in growth for fees & commissions. DBS, OCBC and UOB contraction in wealth management fees of 9.4%, 11.8% and 20% q-o-q respectively as risk aversion sets in during the later half of the quarter. The softer contribution from wealth management has moderated growth in fees to low teens. Benign asset quality. NPL ratio improved by 6bp and 4bp respectively for DBS and UOB. Loans that are not overdue accounted for 48% of OCBC’s NPLs, demonstrating that OCBC is ultra conservative in recognition of NPLs. DBS and OCBC had write-backs in specific provisions due to exposure to the Oil & Gas sector. DBS, OCBC and UOB continue to maintain low credit costs at 12bp, 3bp and 15bp respectively. Rock solid capital base. UOB is the most well-capitalised with CET-1 CAR at 14.5%, followed by DBS at 13.6% and OCBC at 13.2%. Rewarding shareholders with more dividends. DBS, OCBC and UOB declared interim dividends of 60 S cents, 20 S cents (+11.1% y-o-y), and 50 S cents (+42.9% y-o-y) per share, representing payout ratios of 56.6%, 35.9% and 41.8% respectively. 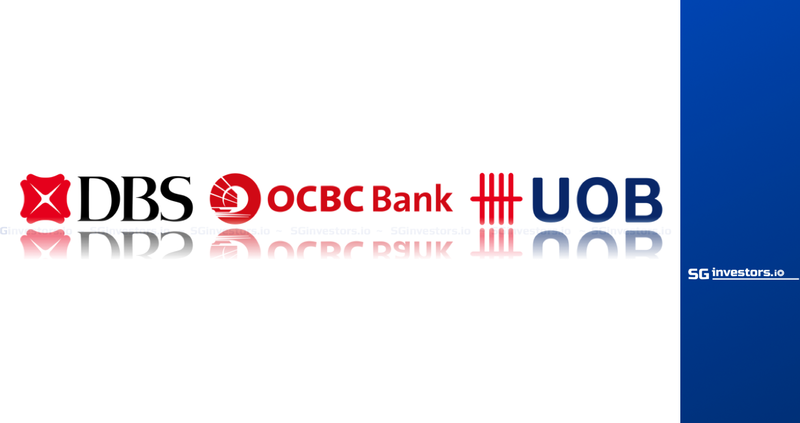 There is room for OCBC and UOB to further increase their final dividends for 2018. Trade conflict between global powers is a big swing factor. The escalation of trade conflicts between the US and China creates uncertainties. Being an open economy reliant on exports, Singapore is vulnerable to disruption to free trade. Banks’ share prices could suffer bouts of volatilities whenever trade war rhetoric intensifies or when the Chinese renminbi depreciate significantly. We prefer OCBC as the stock is a laggard with potential to catch up in NIM expansion and dividend payout. The stock also trades at an attractive P/B of 1.20x, which is 1SD below long-term mean. Improvement in dividend payout and yield.